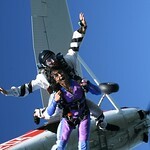 Check out our collection of amazing skydiving pictures from around the dz. Have you skydived with us recently? Look closely, you might just see yourself jumping over Skydive Cincinnati!